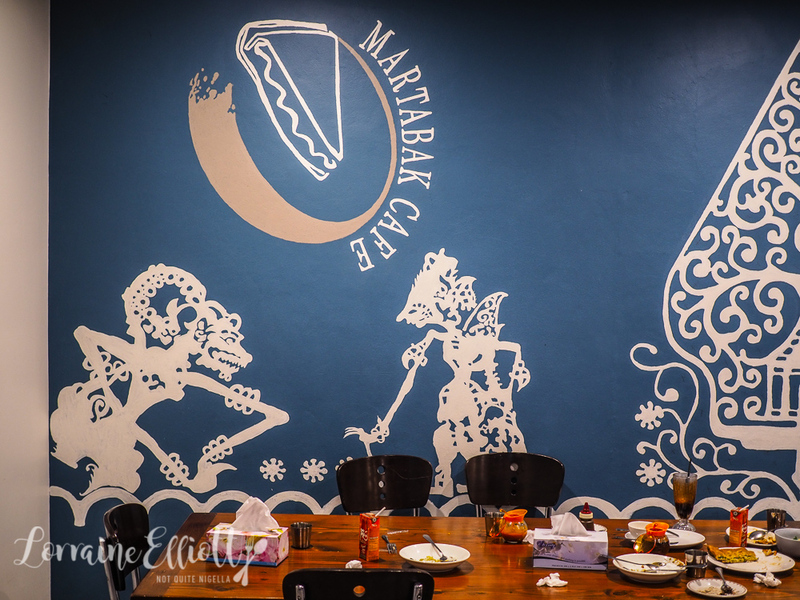 Love Indonesian food and martabak? 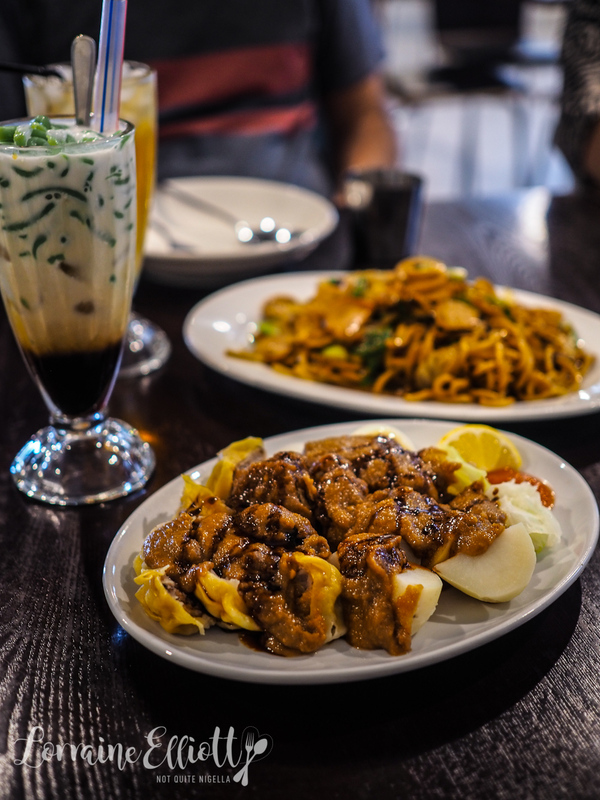 This quaint little cafe on Harris Street in Ultimo sells sweet and savoury martabak pancakes as well as other Indonesian goodies like nasi lemak, roti and noodles. It has been years since I had tried a martabak, that spongy, crumpet-like Indonesian treat. 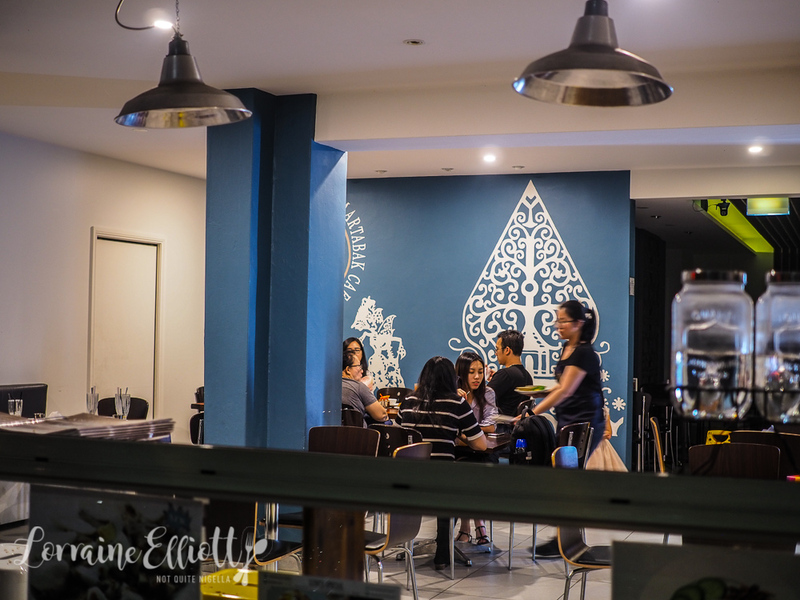 And when looking for a cheap and cheerful place to have dinner with Celia and Pete, we decided to try Martabak Cafe after driving past it on Harris Street in Pyrmont. "You go order," said Celia who was tired and hot. It was an unseasonably and sudden 38C night and there is no air conditioning at Martabak Cafe. At first we are the only people eating but come 7pm when you can park outside other Indonesian families arrive. I go up to the counter to order and then Celia sidles up beside me. "I came to make sure that you wouldn't order 12 things," she said cheekily. She knows me too well. I ask for recommendations - it is salad weather but Celia doesn't like the look of the picture of the gado gado so we order a few items from each category including some drinks. They ask us about the sweetness level we want in our drinks which is nice as sometimes they can be too sweet. We try a few drinks to start with. 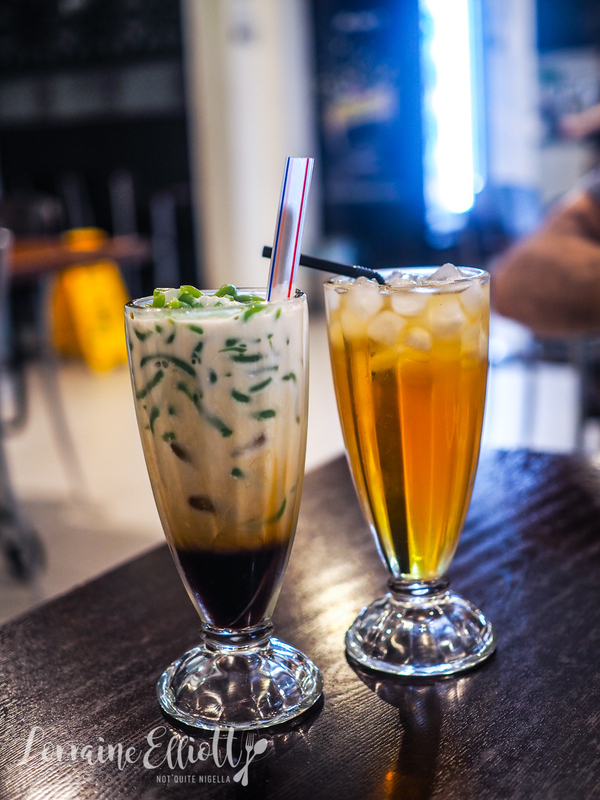 The iced lemon tea is just what we need for this humid heat although the es cendol with its green pandan tapicoa "worms" and sweet coconut milk woujd serve just as well as dessert. 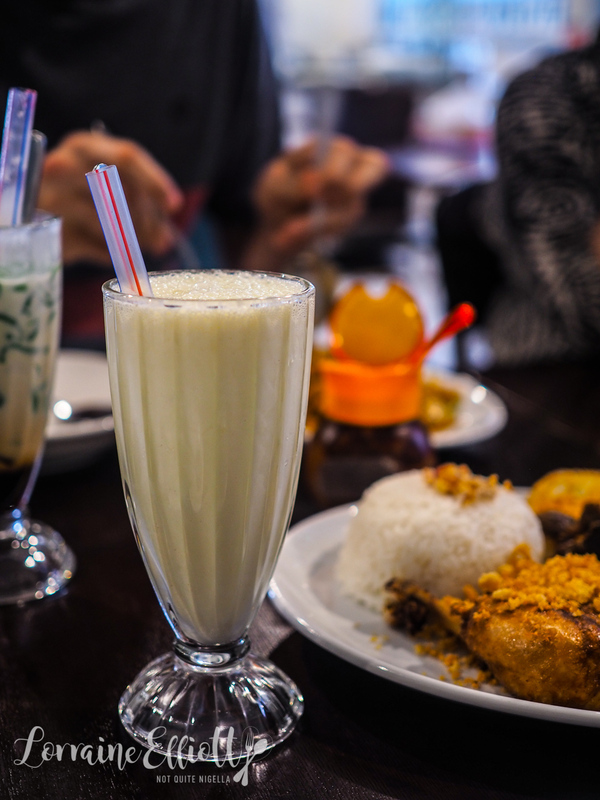 Mr NQN's choice is always the durian shake. Nobody else at the table likes durian except for him and I leave him to it after trying a sip (yes it's pungent and no I did not love it although I don't like durian). 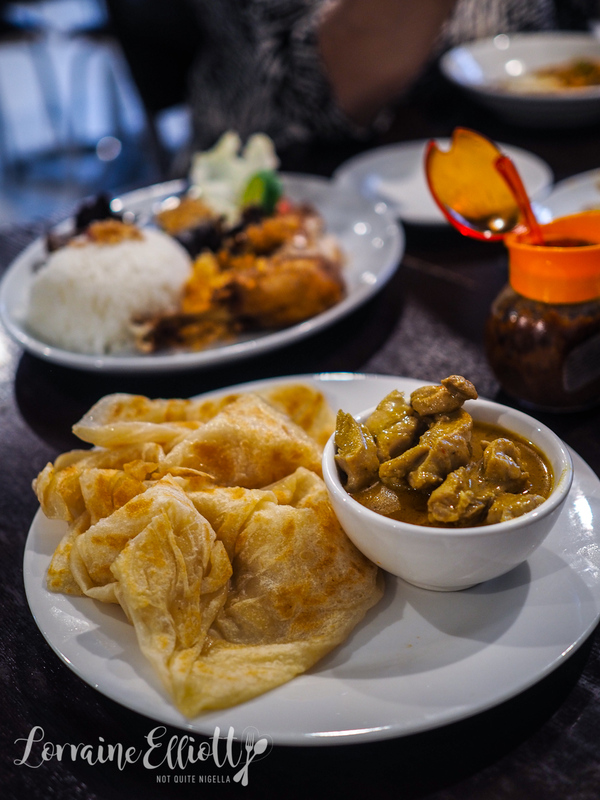 We also order the roti canai with chicken curry. Celia's heritage is Malaysian so she expects the curry to have more punch than it does and to be a darker red in colour from the spices. To me, this is like a mild Thai green curry with a sweetness to it that I like. The roti are quite good although I think I like them a bit crispier and flakier. I always feel that if a place has the name of a dish in the title, you should probably order it. There are sweet and savoury martabaks and there is a choice of 4 savoury ones. The beef martabak comes out sizzling hot and crispy wrapped around a beef and egg filling. 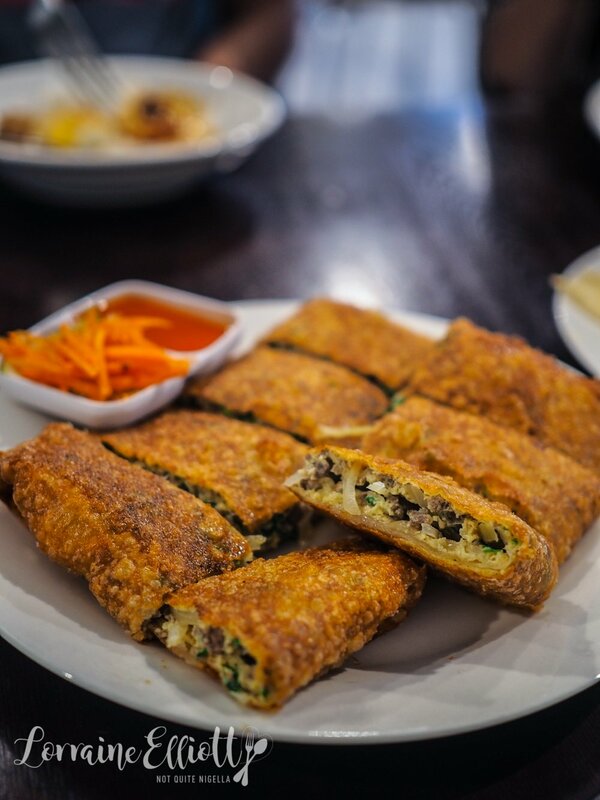 Savoury martabaks are different from sweet ones which are more spongey and crumpet-like. I liked the soimay bandung which is a siu mai dish sort of like gado gado-except with siu mai dumplings and stuffed tofu pieces, steamed cabbage and potatoes in place of crispy vegetables. I particularly like the satay sauce on it. Mr NQN is super thirsty this evening and downs another shake. 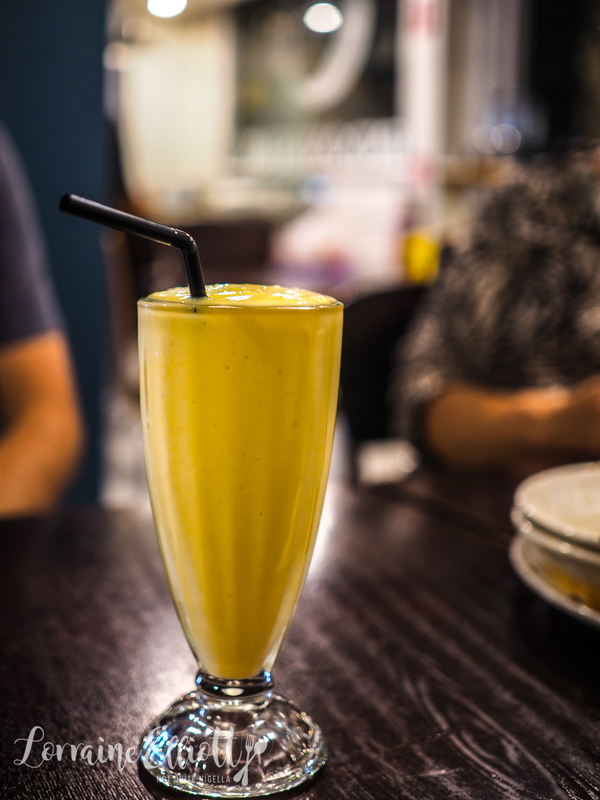 This time it's a mango shake that tastes like fresh fruit and is just the right level of sweetness. This plate has a bit of everything. There's East Javanese smashed fried chicken (really just fried chicken, not sure where the smashed comes into it) with tomatoes, cucumber, steamed rice, fried giblets, fried liver and fried egg. They bring this out with a hot sambal paste. Special note must be made of the sambal that they bring by the pot to the table. 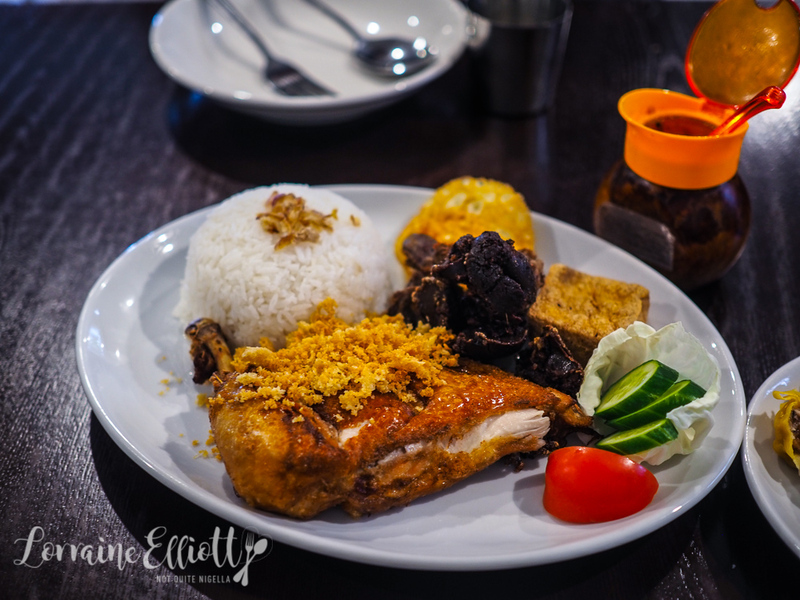 While the food is actually quite mild, the chilli sambol packs enough fiery heat to have our tongues tingling very nicely. I call it a workout for my tongue. 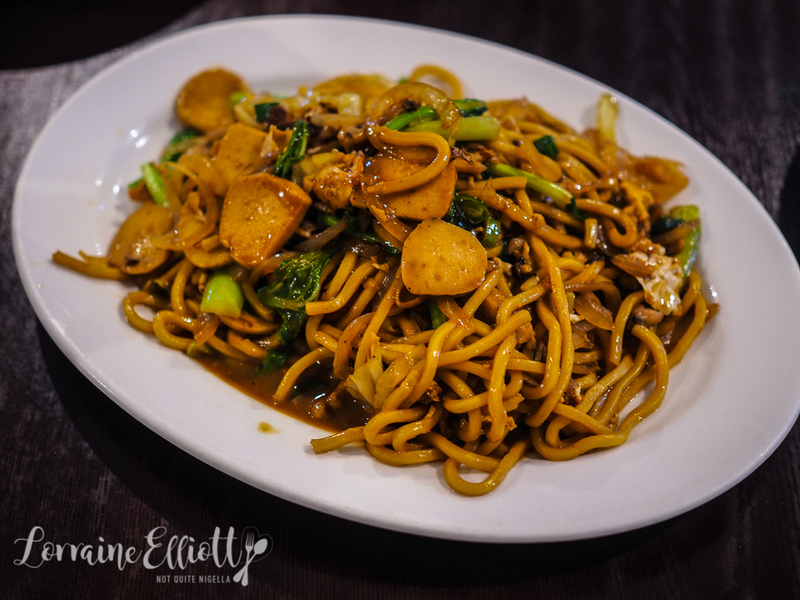 The only dish that we left mostly behind is the mee goreng or thickish fried egg noodle with chicken, tomato, meatball, garlic chives. It's not bad but we've had much better noodle dishes. 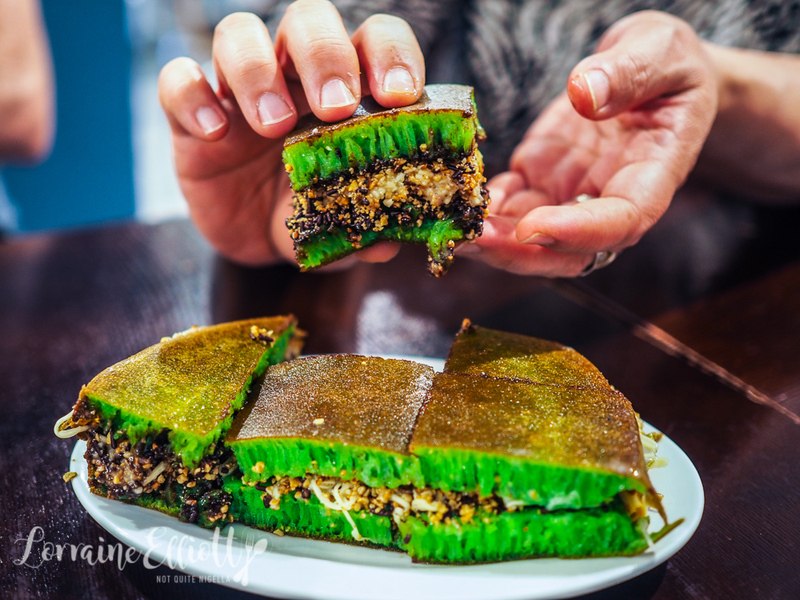 You can get all the sweet martabaks as either a plain or pandan flavoured martabak. We all love pandan flavour, that sweet, rich tropical South East Asian flavour so we pick that along with the filling that has chocolate, peanuts and cheese in it. I love the sponginess of martabak and although some can be quite heavy this is quite light in texture. I love crumpets and that spongy honeycomb pattern although the weirdo in me would probably love this stuffed with honey butter or peanut butter instead. So tell me Dear Reader, if a place has a dish in their name, do you feel compelled to order it? Have you ever tried sweet or savoury martabak?